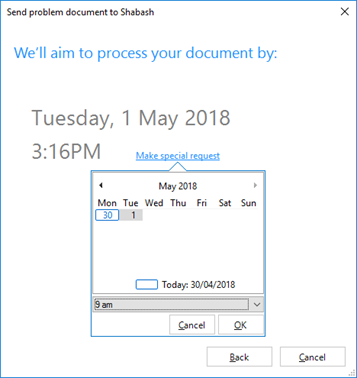 IMPROVED: New Send Problem Document to Shabash dialog. 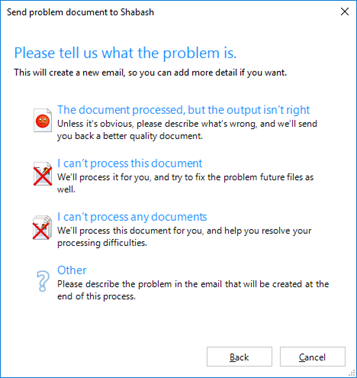 We recommend you use this any time you can’t process a document, or if the result is poor quality and not useful to you. You can launch the tool from the Merops: Home tab, on the Help menu. You'll be then taken through a series of screens to help you send all the relevant files and information quickly. 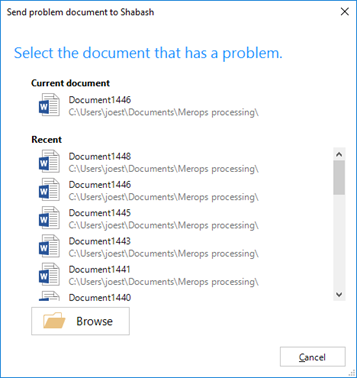 Merops will then create an email, with the chosen document, the Standard Set, the -Original file (if it exists), as well as the log file if the file failed to process, all attached. NB. 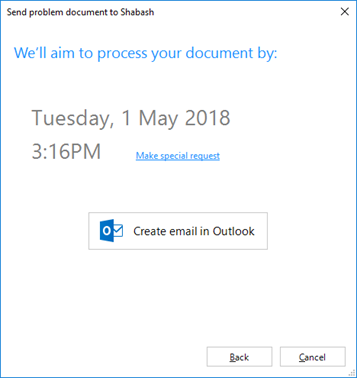 Currently this tool builds an email in Outlook, and then you can add any additional notes before sending it. 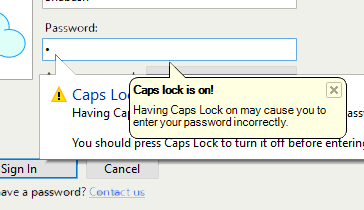 If you or your team do not use Outlook, please let me know, and we’ll add another method. IMPROVED: Look Up (Word 2007 or higher): Using Look Up tool in documents with tracked changes could take several seconds to work out what term should be looked up. It's now over 100X faster. IMPROVED: Look Up: 21 URLs updated and simplified. IMPROVED: Look Up: Cambridge Advanced Learner's Dictionary and Cambridge Dictionary of American English replaced with Cambridge English Dictionary, which includes both UK and US preferences. IMPROVED: Look Up: Encyclopaedia Britannica is hidden by default, Oxford Dictionaries Online is shown by default. IMPROVED: Look Up: Google Maps (UK) and Google Maps (US) replaced with Google Maps, because Google now localizes the result for both versions. 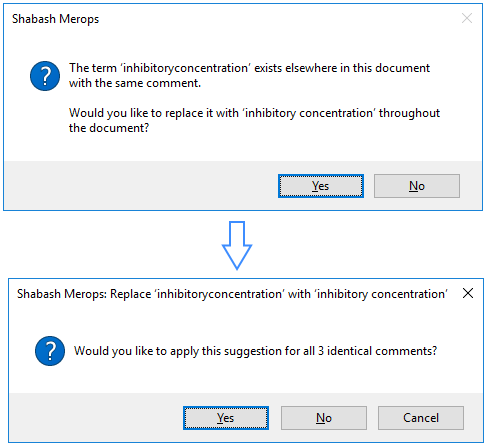 IMPROVED: Merops for Microsoft Word: When right-clicking on a comment and choosing a selection, if tracked changes are enabled, the insertion appears on the right of the deletion, rather than to the left. IMPROVED: Standard Set Editor: Clarified wording on setting: "Repeat other symbols in ranges:" changed to "Repeat other symbols in ranges and groups:"
IMPROVED: When processing unsaved files, the default name will not be the same as any existing files that end "-Original". IMPROVED: Look up: New Yahoo 32x32, and new Cambridge English Dictionary icons. FIXED: Attempting to delete item from Process History did not work. FIXED: Default Merops username included the user's domain. FIXED: Help file: Wrongly referred to the Start-up page of Merops Options, which was replaced with the Reviewing page a while ago. FIXED: Look Up (Word 2007 or higher): Using Look Up tool in document with tracked changes could make the screen scroll to a different place in the document. FIXED: Look Up: Answers.com, Dorland's Medical Dictionary, Chambers Dictionary, and Chambers Thesaurus were broken because the sites had changed. FIXED: Look Up: Chambers 21st Century Dictionary was turning itself back on every time you opened the Merops Options dialog. FIXED: Look Up: Encylopaedia Britannica button could not be hidden using Merops Options. FIXED: Look Up: Go to now link in Merops options on Wiktionary in fact went to Wikipedia.org. FIXED: Look Up: Updated Google Maps, Yahoo Search, and Bing icons in Merops Options to match icon elsewhere in Merops. FIXED: Merops for Microsoft Word: If the last paragraph return in the document was styled as "Cross-reference", Merops would hang half way through reference renumbering, and would not complete. FIXED: Merops for Microsoft Word: Reference renumbering could be influenced by footnote symbols in the author by-line. FIXED: Merops for Microsoft Word: Reference renumbering now works with introduced citations, e.g. "reference 4". FIXED: Merops for Microsoft Word: Reference renumbering showed an error if the last reference was uncited. FIXED: Merops for Microsoft Word: Right clicking on unmatched terms with suggestions gave suggestions from Word, not from the comment. FIXED: Merops for Microsoft Word: Updated Answers.com Look Up to work with their new URL. FIXED: Merops for Microsoft Word: When right-clicking on a comment and choosing a selection, if tracked changes are on, if you then accept Merops's suggestion for all identical comments, each subsequent comment added the tracked change of the previous item. FIXED: Processing History: Clicking Choose columns > Processing time wrongly showed/hid the Date column. FIXED: Standard Set Editor: "etiologic/ical" moved to "aetiologic/ical", with a link from "etiologic/ical". FIXED: Standard Set Editor: A number of links did not work. FIXED: Standard Set Editor: If an error occurred following a link, it would repeated appear despite choosing Cancel. FIXED: Standard Set Editor: Load from Oxford Dictionary now sets "while/whilst" to "preserve original", as the dictionary does not express a preference. FIXED: Standard Set Editor: Minor graphics issues with drag preview on reference sort boxes. FIXED: Standard Set Editor: The document example was not showing underline correctly. 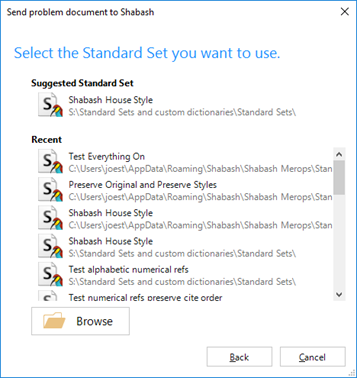 FIXED: Standard Set Editor: The document example was not showing Caption title format. FIXED: Standard Set Editor: 'theoretical' is now listed as the top option for theoretical/ic.